My dad started working in his dad's jewelry store when he was a teenage boy until he and my mom opened their first store in 1962. He successfully ran the store until several years ago, when he decided to "retire" and work part time from a small office. I worked with him for over 20 years and when he retired and closed his doors nearly 4 years ago is when we started Gone Coastal Jewelry. 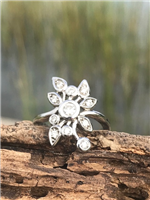 After a few years of working part time my dad decided it was time to permanently shut the business down so he asked me to help him sell the remaining inventory.Our Custom Fine Jewelry pages contain my families designs. We now have Diamond and Colored Gem Stones, Pendants, Earrings and Rings which we are offering at a 50% off discount which is already included in the price. 14KT White Gold Longhorn Shape Baguette Diamond Pendant on a 20" 14KT White Gold Rope Chain. Perfect For Texas Longhorn Fans! 14kt White Gold Diamond Circle Journey Pendant on a 18' 14Kt White Gold Rope Chain. 14KT White Gold Diamond Circle Pendant on a 14KT White Gold 20" Wheat Chain. 50% off Discount which is already included in the price! 14KT White Gold Scroll Diamond Solitaire Set, pendant is on a 18" Rope Chain. 14kt White Gold Oval Fire Opal and Round Diamond Pendant and Earrings Set. The Pendant hangs on a 14kt White Gold 20" Cable Chain. 14kt White Gold Garnet and Diamond Dangle Necklace and Earring Set. The Pendant is on a 16" Box Chain. 14kt Yellow Gold and Diamond Humming Bird Pendant on a 16" 14kt Yellow Gold Cable Chain. Fire Opal and Diamond Necklace and Earring Set on a White Gold Rope Chain. 14KT White Gold Ausltralian Oval Opal and Round Diamond Pendant on a 14KY White Gold 20" Rope Chain. Yellow and White Gold Pearl and Diamond Cut Gold Bead Dangle Necklace. 14KT White Gold Princess Cut Diamond Solitaire Studs With 14KT White Gold Screw Backs. 24 " 14kt Yellow Gold 3 MM Solid Rope Chain with a Yellow Gold Box Clasp. 14kt White Gold Yellow and White Diamond Pendant on a 14kt White Gold 18" Rope Chain.